1. DURABLE: Durable Crafted from water resistant and tear resistant 900D oxford, durable construction. 2. CARRYING SYSTEM: Padded and breathable mesh back panel and shoulder straps offer cushioning comfort, while also promoting air circulation along your back and shoulders. 3. 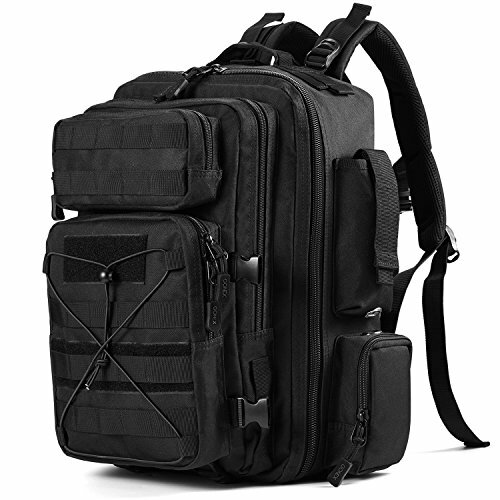 MOLLE SYSTEM: MOLLE external expansion system designed to be used in combination with other equipment; you can load pockets, water bottle bag, accessory kits and other. 4. MULTI-USE: it can use as a backpack as well as single-should messenger bag added with a shoulder girdle of the front bag. Its decompressed thick shoulder girdles are designed according to the principle of human body engineering, which 2.0cm thickness girdles are more comfortable and reduce the pressure of shoulders.5. GUARANTEE: We offer a 100% full love it or return it guarantee, our outstanding customer service is our Number One Goal. ?Reasonable CAPACITY Capacity: 30L (Dimension 17.5x11x9.1 inch, Weight: 1.23kg.) ?It can accommodate about 30L, including IPAD, toilet requisites and so on. ?Human Body Engineering?It can be used as a backpack. Its decompressed thick shoulder girdles are designed according to the principle of human body engineering. 2.0cm thickness girdles are more comfortable and reduce the pressure of shoulders. ?Durable Construction & Smooth Zipper?Crafted from water resistant and tear resistant 900D waterproof oxford. It has smooth zipper selected from military SBS zipper. ?CARRYING SYSTEM?Padded and breathable mesh back panel and shoulder straps offer cushioning comfort, while also promoting air circulation along your back and shoulders. ?MOLLE SYSTEM?MOLLE external expansion system designed to be used in combination with other equipment; you can load pockets, water bottle bag, accessory kits and other.